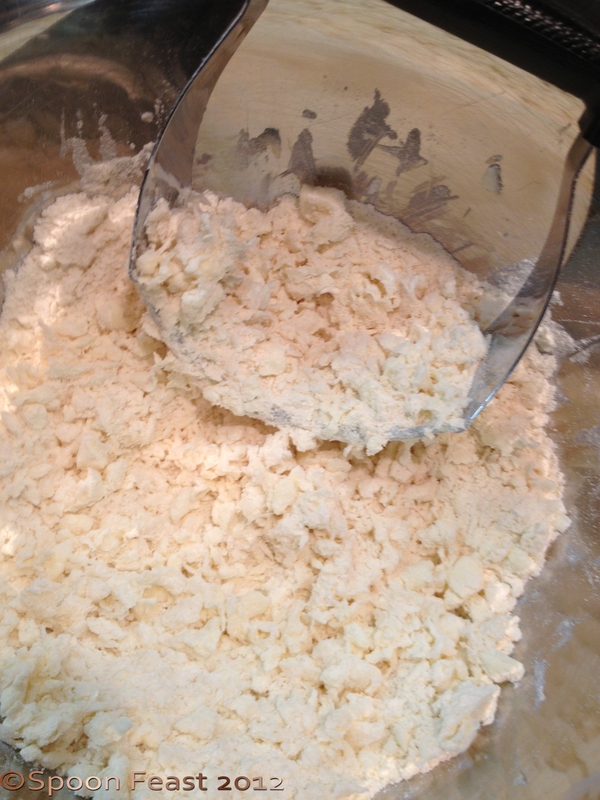 Here is a super simple dough to use for pies and tarts. One key to working with any tart dough is to keep it cold. This allows the fat to melt while baking which creates light, flaky crusts. With lots of holiday events approaching, here is a simple basic approach to a nice pie or tart dough. If you want a double crust, double the recipe. This only makes 1 crust. Easily done by hand, you can also use a food processor, just pulse the ingredients without the water, add water, bit by bit to make the dough mass. You may use all the water, only some or you may need more. It depends on how much moisture your flour holds. If creating the crust by hand, combine the salt and sugar with the flour. Cut the cubed butter into the flour using a pastry cutter, two knives or a fork. When the mix resembles a coarse mixture (you still want to see some globs of butter, don’t make it smooth) add the ice-cold water tablespoon by tablespoon. The mass should come together. Only use as much water as you need to bring the ball together. You may need more water or less water. This is why you add it bit by bit. 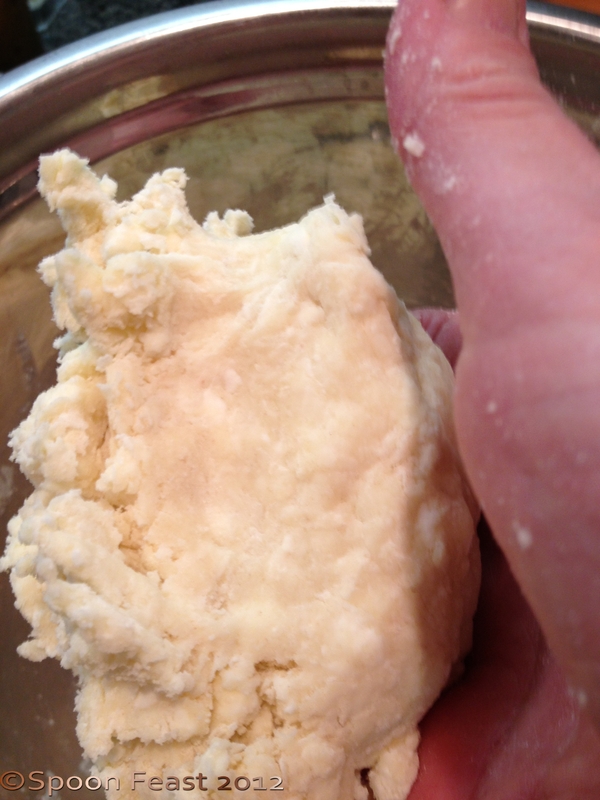 Add enough water to just bring the dough ball together when you squeeze it. You want to see blobs of fat in the dough, not smooth. Press the dough into a ball and place it between 2 pieces of plastic wrap. Press it into a disk. 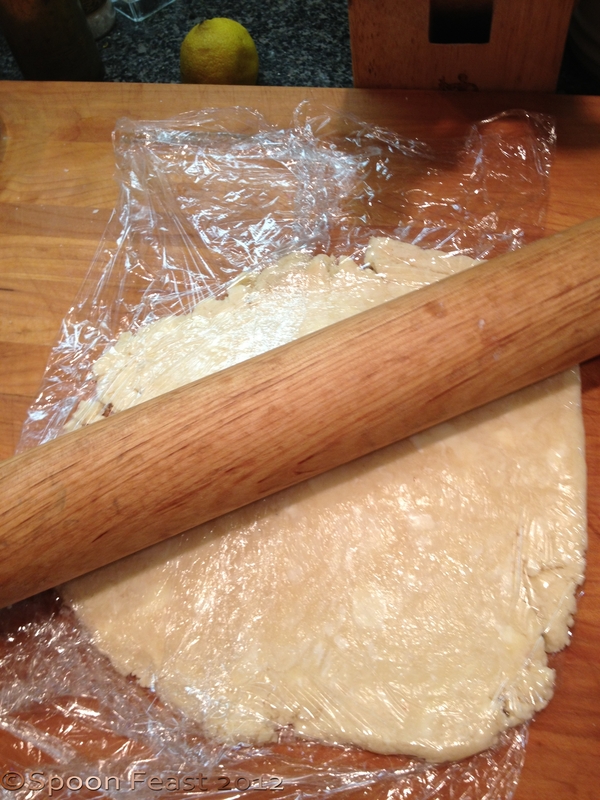 Roll the chilled dough out to the size you need while it is still in between the wrap. This makes it easier to handle and is much easier to clean up too. Remove one side of the plastic wrap. Position the dough over the pie or tart pan and press it into place. Alternatively, you can press the dough into the pan and then chill while you prepare the filling. 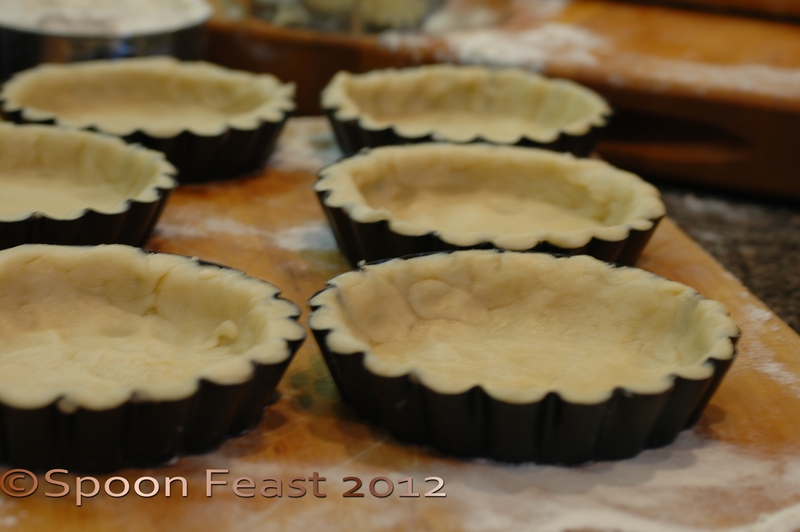 Much easier is to use the fluted tart pans with the removable bottoms. 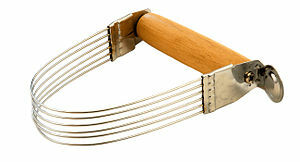 Press the dough into the tart pan. Make sure you have at least 1/4 inch at the sides and at the curve of the pan so it is strong enough to stand on its own when the pan is removed. The fluted edge pans give all your tarts such a professional finished look, they are so worth the investment. Since they come in many sizes, you can make large tarts or small individual ones and any size in between. Ready to fill and bake. See the fat? That means you will have a flaky crust. Fill them just as you would a pie. 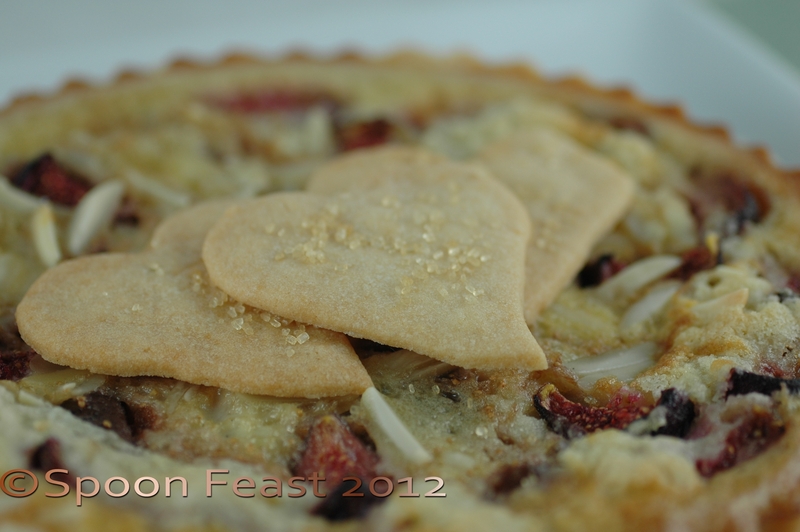 If you use a top crust, decorate it with dough cut outs instead of just a pile of dough on top of the filling. Or use a strusel topping or leave the fruit exposed and glaze with melted apple or seedless raspberry jelly when the tart is done. This puts a “sealing glaze” on the fruit and makes it shiny. 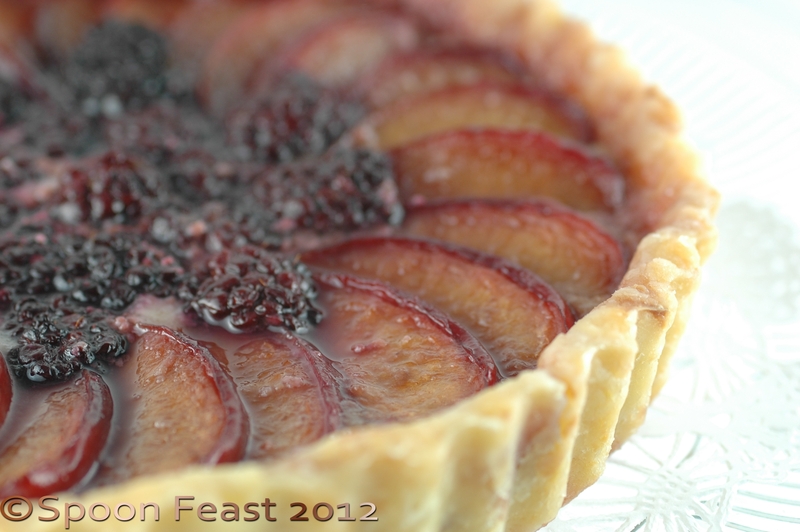 The photo of the Plum and Blackberry Almond Tart at the beginning of this post is finished with melted red currant jelly. Here are some of my thoughts about using other ingredients besides water and butter. Butter: Fat is fat, at least the melting point of butter is lower than body temperature. Fat provides tenderness and flavor to the crust. I’d rather eat butter than Crisco or lard or hydrogenated oils like margarine. I have yet to try coconut oil. Water: Some recipes will ask you to use vodka instead of water. It provides a flaky crust too. Alcohol evaporates faster than water therefore creating a flakier crust. Try it if you like. I don’t drink distilled spirits so it never occurs to me to use vodka. Flour: Use a good quality organic flour. You can use gluten-free flours too. I’m just not too sure how strong the non-wheat flours will hold up in a fluted pan once the outer ring is removed. My experience is most gluten-free baked goods are crumbly due to the lack of gluten. Not sure how to over come that but since I’m not gluten-free, I use King Arther’s unbleached AP flour and I get pretty crusts. I do know if I had to go gluten-free, I would miss pie crust, tarts, and good chewy bread tremendously. No matter what liquid you use, just be sure it is ice-cold. I use a large measuring cup with lots of ice and water and scoop what I need from there. When finished, I pour the cold water into a glass and make lemonade or tea. I suppose you could do the same with vodka. Use lots of ice. Bake off empty shells by lining with parchment and filling with rice or beans and baking until done. Fill with fresh fillings. 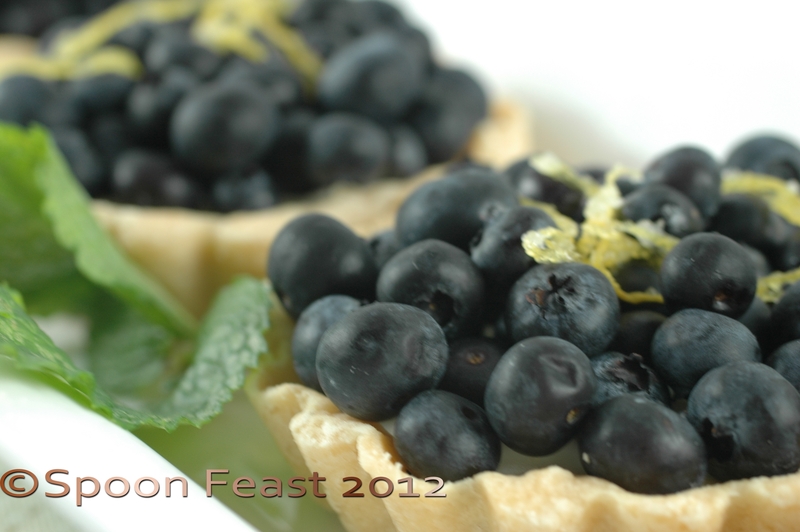 Fill unbaked shells with fruits, custards, fillings and bake until golden and bubbly. Times vary but usually take 45-55 minutes in a 350°F oven. There are so many finishing and fillings! Use any left over scraps to make dough cut outs. Egg wash them and sprinkle with sugar. Bake on a cookie sheet until golden brown. Use these on the top of the tarts, place them when the tart is still hot from the oven or serve as a garnish with each serving. This entry was posted in basic skills, Cooking, Recipes, Southern Cooking, Teaching Culinary School, To Tyler: How to Cook:, What every good cook should know and tagged Baking, Crust (baking), Dough, Flour, making pie crust, Pie, Tart. Bookmark the permalink. 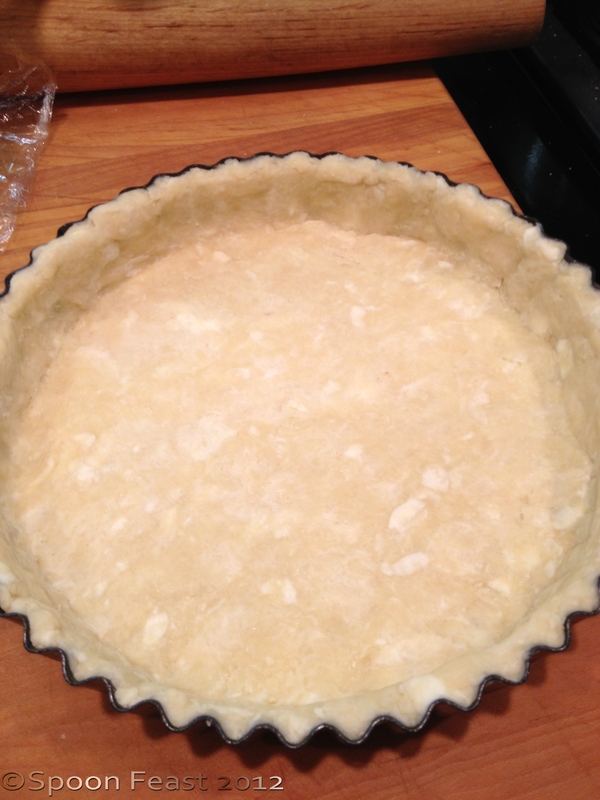 Such a thorough post on making pie crust. Just keep things cold, it is very quick and easy. I look forward to seeing what you fill yours with soon! That looks lovely Pamela! Thanks for the tip about the vodka too – there’s always lots floating around here, so I’ll give it a go!